This weekend we are hosting my sisters in law, Lauren and Lisa. The former is vegetarian, the latter is vegan. I was perfectly prepared for this and had plans for dinner until I received a text message from Lauren at 11:04 AM stating that there was also a gluten free element in the mix. With my plans changed I had a fantastic idea: Ethiopian food. Sure, I don't know anything about Ethiopian food or cooking it but I have eaten at Ethiopian restaurants as many as five or six times. Besides, the delicious bread they serve, injera, is made with teff which has no gluten. It was the perfect solution! It wasn't until I started cooking at 5:00 PM that I looked up a recipe and saw that the best case scenario for making authentic injera was going to take 2-3 days to allow the teff to ferment. This posed a slight problem that I had to mull over as I made the main course. I cooked some garlic, ginger, onion, carrot, and potato in safflower oil for a few minutes before seasoning with Berberé spice blend and salt. Then I added some leftover Jersey tomatoes and vegetable stock to the pot. 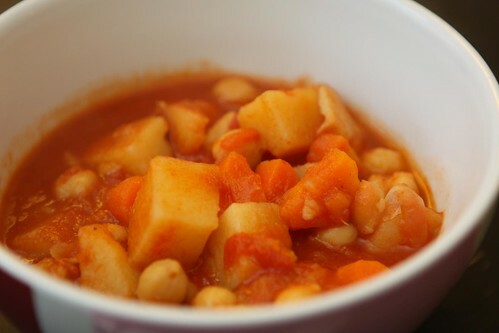 Once everything was fully cooked I added in some garbanzo beans and simmered for another hour or two. This gave me plenty of time to mull over my injera problem. Then it struck me: I would do the next best thing. I had some grinder rolls in the freezer from our recent trip to Rhode Island. It's like the poor man's injera which is kind of confusing since injera is traditionally made by poor farmers. 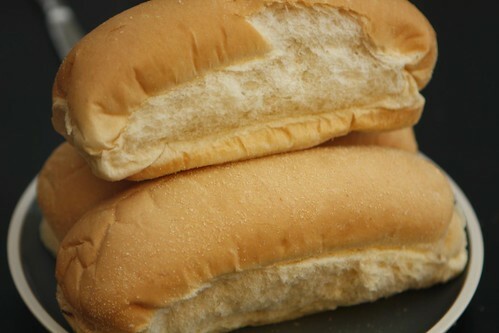 However, in our privileged country grinder rolls are about one of the cheapest foods you can purchase. At least in Rhode Island and the surrounding area. No one else has actually ever heard of grinder rolls. This, of course, did not solve the gulten free problem at all so I also cooked some brown rice. For beer I really wanted to have a beer from somewhere in the vicinity of Ethiopia. In college we used to drink a beer (or maybe a malt beverage) called Mamba. To the best of my knowledge that is the only African beer I've ever had. It wasn't particularly good but it was fun to say, "Mamba." It appears that this beer is a little difficult to find these days so I went to my beer cellar (also referred to as the bottom of my fridge) and pulled out the beer from the closest country to Ethiopia . . . Most experts would recommend that you have a lager with spicy foods but lately I've really been enjoying having heavier, darker beers with spicy food. 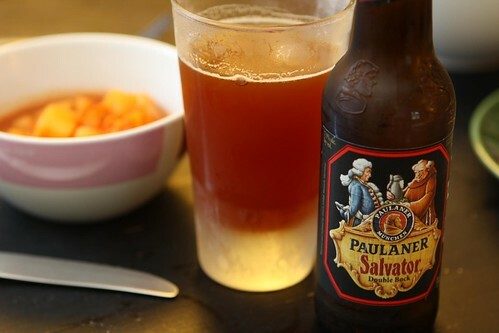 This dopple bock from Paulaner Brewery went quite nicely with the spicy chickpea stew as far as I'm concerned. I've put together some of the ingredients on the counter and I'm going to see if I can ferment up a starter quickly enough to make some real injera with the leftovers. If I can manage to ferment the starter before the leftover stew ferments than we'll be in business. Maybe reading recipes isn't such a bad idea after all. I am looking forward to the day when you learn how to make injera! Maybe I should try to learn how to make it myself. Combined with Paul's dream of learning to speak Ethiopian, it would make us quite a couple of Ethiophiles! You should try to find someone who sells Harar or Meta beer; they are both from Ethiopia and they are both good! My favorite is Harar, which is I think paler (and apparently has no hops? according to Julie's husband Adam. I know nothing about beer!) If you ever invite us over to eat homemade injera and drink Harar beer I will be super excited. Ooh. I need to look for that beer. I've had some injera starter going for 2 days now. I'll keep you posted as to how it eventually turns out.